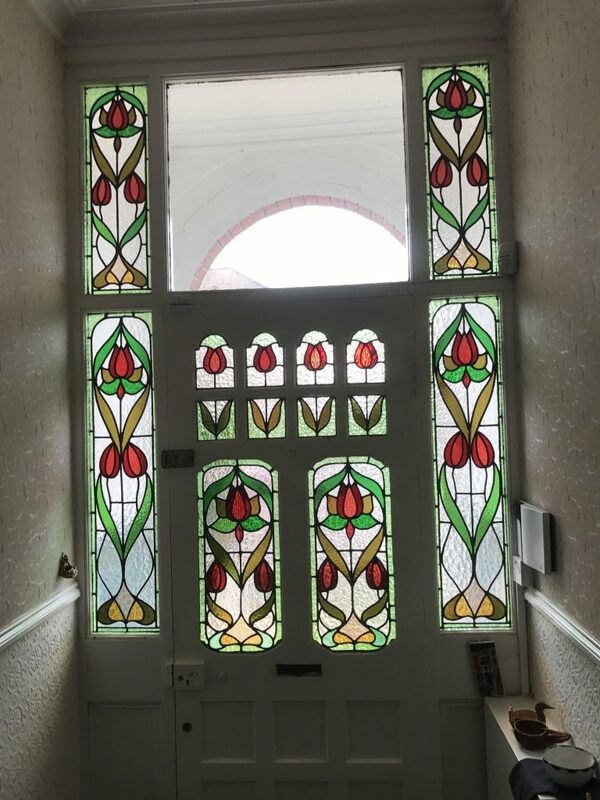 Panels of stained glass and leaded lights do not last for ever but they can usually be repaired or restored to their (almost) original condition. Apart from the glass cracking (usually due to impact) the cement – the putty that hold the glass firm in the leads – deteriorates over time, becomes powdery and eventually falls out. When this happens much of the rigidity of the panel is lost, and it becomes loose, and begins to bow – become concave or convex. Once a panel of stained glass has begun to bow, usually the best solution is to remove it (and fix boarding over the opening for security), take it apart from the old lead (which is the scrapped and recycled), wash the glass, rebuild the panel with new lead and cement and then reinstall, often with new supporting bars to which the panel is secured with tie-wires. If a lot of the glass has been broken, then this same rebuilding approach is followed, although it may not be necessary to rebuild the whole panel – just the damaged section. In some cases a broken piece of glass in a stained glass panel can be replaced – almost invisibly – in situ – without needing to remove the panel from the door or window. However when there are several pieces broken, where the panel is badly deformed, or when its in generally shaky condition, this is much more difficult, and it may be better to remove the panel, take it apart, and reassemble with all new lead, using as much of the original glass as possible. If there are just one or two cracked pieces we generally suggest leaving them alone, unless there is some particular reason to replace them. Particularly precious pieces – painted or stained pieces or moulded ‘jewels’ than have become broken may sometimes be glued back together. Pieces of painted glass (birds, scrolls or other decoration) that are badly broken or lost can be copied.